The store in Brattleboro, Vermont, is small but our love for fabric is gigantic. People who come to visit us are always surprised that such a place is possible. Delectable Mountain Cloth is an extravagant adventure for natural fiber textile enthusiasts. 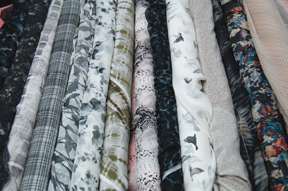 Featured fabric: printed silks. At any time Delectable Mountain Cloth has a fine array of textiles such as silk charmeuse, chiffon, organza, dupion and more. We also have cottons and linens and wool, including our famous selection of fine whites suitable for a wide range of projects from heirloom sewing, doll clothes and lingerie to home decor, and of course bridal. Please contact the store for availability or accessibility of whatever your natural fiber textiles needs are. If we don't have what you need in the store, we may be able to find it for you. Mail order inquiries and sample requests are very welcome. Customers from far and near are enthusiastic about our small piece assortments of silks that are especially suitable for crazy quilting. Open Monday through Saturday at 10am, Sunday 1pm. Close Saturday through Thursday at 5pm. Friday evenings we stay until 6:30pm. Brattleboro stays open late the 1st Friday of the month for Gallery Walk - it's a party until 9pm!